Combine ground spice ingredients, ingredients (B) and seasoning (C) in a mixing bowl. Stir well to mix. Add mashed beancurd, chopped tau pau and potatoes. Lastly, add the egg to mix until thoroughly combined. 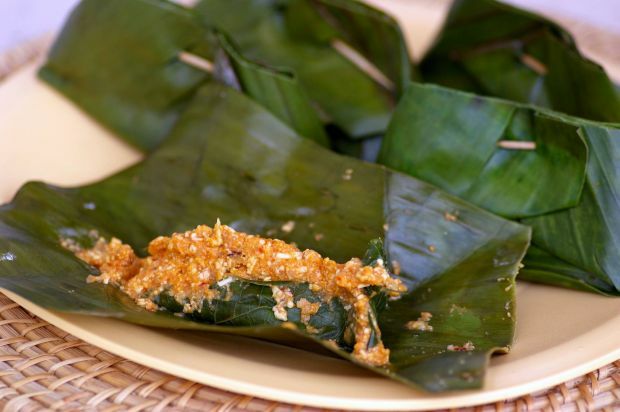 To wrap, place two kaduk leaves on a banana leaf square. Place 2 tablespoons of mixture onto the kaduk leaf and fold into half, then fold both ends to secure. Fasten with a toothpick. Trim the top neatly with a pair of scissors. Steam for 15 minutes.